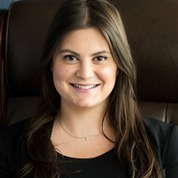 Emily Ashe is an associate in the Mass Tort Department at Anapol Weiss. She concentrates her practice on defective medical devices and pharmaceutical drug cases. Prior to joining the firm, Emily interned at the Juvenile Law Center in Philadelphia. She also interned at Kenneth Cole Production’s in-house legal department in New York City. Emily is a member of the New York County Lawyers Association and the New York State Bar Association. She is admitted to practice law in New Jersey and New York. Emily is admitted to practice law in New Jersey and New York, as well as before the U.S District Court for the District of New Jersey. While attending law school, Emily was a member of the Jewish Law Students Association.